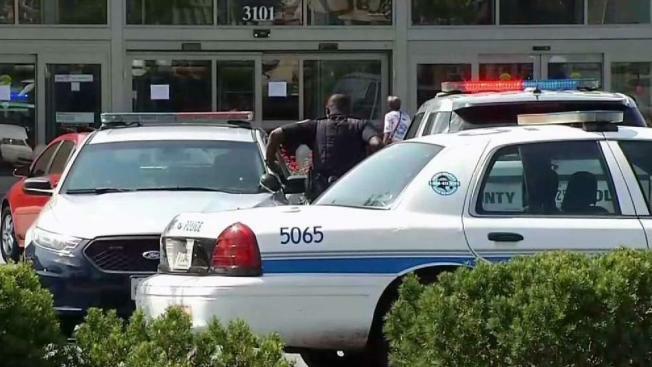 Shoppers at a Target in Forestville, Maryland, saw a suspect stab a man before holding a woman at knifepoint outside the store Wednesday, police say. Prince George's County Police Officer Irving Estime said he was inside the store on Donnell Drive when he saw a man with a knife who had just stabbed another man about 12 p.m. The suspect then threatened a woman with the knife outside the store and held the weapon to her throat. Estime ordered the suspect to drop the knife and let go of her. "It was very hard. The backdrop, the customers, the people who were all around," Estime told News4. As more officers rushed to the scene, the officer continued to keep the suspect's attention, which allowed the other officers to use a Taser on the suspect, police said. "We just wanted to try to end the situation safely without anybody being harmed. Just communication was the biggest thing. Making sure I kept contact with him telling him, 'Hey, man. Drop the weapon you don't want to do this,' to let her go, and it helped. It worked," Estime said. Police arrested the suspect and said the woman was not hurt. The man stabbed inside the store was stable, police said. The suspect and the victims all knew each other, according to police. Police are asking anyone who saw the incident to call 301-772-4433.